Atlantic City, 1922: The Roaring '20s are about to begin in earnest and despite a booming economy, alcohol is scarce and gangster violence is heating up. 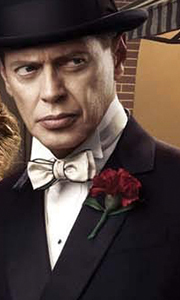 Amidst this backdrop, Nucky Thompson (Steve Buscemi), whose marriage to Margaret has become a sham after she signed away his highway windfall to the church, faces the challenge of mending old relationships. Nucky also encounters new competition from a hair-trigger gangster who builds a..
From Academy Award nominee and Emmy Award winner Terence Winter and Academy Award-winning director Martin Scorses, the Emmy-winning HBO drama series Broadwalk Empire chronicles the life and times of Enoch "Nucky" Thompson (Golden Globe winner Steve Buscemi). Over the course of five seasons, Nucky undergoes vicious power struggles and deals with opportunistic rivals - including Arnold Rothstein, Lucky Luciano and Al Capone - at a time wh..
From Emmy-winning writer Terence Winter (The Sopranos) and Executive Producer Martin Scorsese, Boardwalk Empire begins in Atlantic City in 1920. It is the eve of Prohibition, and county treasurer, Enoch 'Nucky' Thompson (Steve Buscemi) is looking to cash in. As the undisputed 'Boss' of Atlantic City, Nucky leads a double life as a politician and bootlegger, and must battle with a relentless federal agent, ambitious underlings, and oppor.. Season two of Boardwalk Empire, the Golden Globe winning series from Emmy winning writer Terence Winter (The Sopranos) and Executive Producer Martin Scorsese begins in 1921 Atlantic City. In the wake of Prohibition, Enoch "Nucky" Thompson (Steve Buscemi) wields ultimate power in the "the world's playground." After rigging the Atlantic City mayoral election, Nucky and young WWI veteran Jimmy Darmody appear to be in control of the city. H..
Atlantic City, February 1924: Picking up 8 months after the events of Season 3, Nucky Thompson is laying low at the end of the Boardwalk after barely surviving an overthrow by gangster Gyp Rosetti. But the calm will be short-lived, as Nucky faces new challenges, including a clash with a violent Harlem power broker, a battle with his brother Eli over Eli's college-age son, and the irresistible lure of lucrative - and perilous - opportuni.. Concluding a powerful and groundbreaking series, Season 5 begins in the throws of the Great Depression. With the end of Prohibition near, Nucky seeks to forge legitimate alliances with liquor producers; we look at significant childhood events that shaped the relationships between Nucky, Eli, the Commodore, Gillian and others, and their futures. Special Features Special Features May Not Be In High Definition. Audio & Subtitles May Vary,.. Concluding a powerful and groundbreaking series, Season 5 begins in the throws of the Great Depression. With the end of Prohibition near, Nucky seeks to forge legitimate alliances with liquor producers; we look at significant childhood events that shaped the relationships between Nucky, Eli, the Commodore, Gillian and others, and their futures. Special Features Scouting The Boardwalk: Hear how the Location Managers of Boardwalk Empire ..